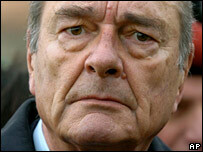 Former French President Jacques Chirac has undergone successful surgery to fit a pacemaker, his office has said. The heart device was fitted on Friday morning, after Mr Chirac, 75, was admitted to La Pitie Salpetriere hospital on Thursday. The procedure, which had been scheduled following a routine check-up, went "perfectly", his office said. Mr Chirac was replaced by Nicolas Sarkozy last May after 12 years as president. He is due to return home from hospital at the weekend, his office said. The former leader has been under investigation for misuse of funds while Paris mayor, having lost immunity after his presidency ended. He has consistently denied any wrongdoing while he was mayor of the capital between 1977 and 1995. In a political career spanning four decades, he was also prime minister twice.